First of all, let’s put his epitaph right out front: Without Rod McKuen, there would be no Seasons in the Sun. 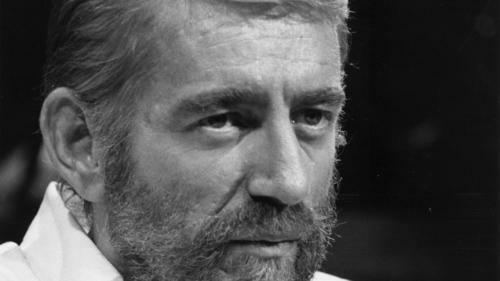 Few poets live and die in Beverly Hills, but Rod McKuen did just that. This strange fact alone stoked my continuing interest in the man. He’s considered one of the best selling poets of our time, which in itself is suspicious…”best-selling” and “poet” are two terms that should be mutually exclusive. Yet, McKuen was a millionaire from his prolific writing before the age of 40. In truth, he was more of a raconteur than a poet. He was one of those guys who was always on the scene: First reading poetry at North Beach coffeehouses alongside Ginsberg and Kerouac in the ’50s, then hitting Paris in the late 50s/early 60s when Paris was the intellectual capital of the world, and ultimately, cashing in and moving to Hollywood during the late 60s, when the Counterculture began taking over movies, tv, and music. Despite being such a household name (to people of a certain age, anyway), there is little of McKuen’s legacy that remains relevant even a few decades later. He wrote the song “Jean” (1969) that you may still hear on AM radio oldies stations, but his most enduring legacy is bringing the cult-classic “Seasons in the Sun” to the masses. He didn’t write the song and he didn’t perform the song, but he translated the French lyrics written by Jacques Brel into English (McKuen met Brel during his Paris years), which allowed singer Terry Jacks to record the classic version released in 1974 that went on to become one of the top-selling singles of all time. Without Rod McKuen, there would be no Seasons in the Sun. That pretty much says it all. Thanks for this, Dave. Yeah, a strange case. Worthless as a poet – beyond good and evil and good and bad. In a category all by himself. But as a songwriter, he left a small, durable mark. It must be said: he was unafraid of displaying emotion.